Twenty is plenty in Boston, according to its elected officials. The City Council voted unanimously this week to lower the default speed limit on most residential streets to 20 mph — and not for the first time. Speeding is the number one complaint council members hear from residents. 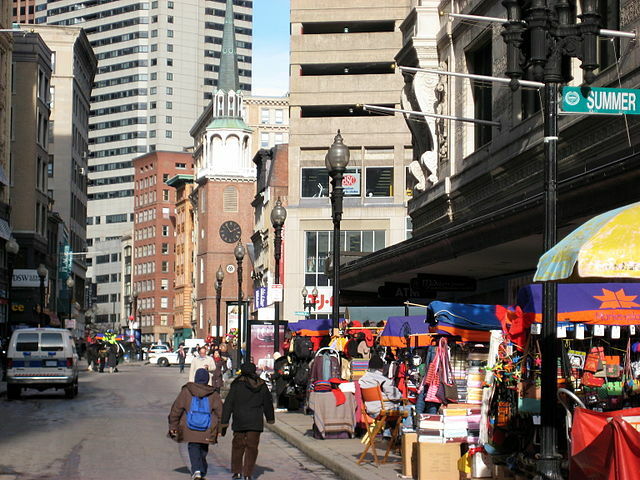 And on Boston’s narrow streets, packed with pedestrians, driving 40 mph — as people regularly do — is especially dangerous. The current speed limit is 30 mph, and, unfortunately, changing it isn’t as easy as passing a City Council rule. The state of Massachusetts sets default speed limits, and when Boston tried to lower its speed limit before, state law prevailed. Jackie DeWolfe at Livable Streets Boston says advocates are hopeful this time will be different, but it won’t be easy. Boston launched a Vision Zero task force last year, and that is raising awareness of the speeding problem. One encouraging sign of progress was that during this round of City Council discussions, Boston Police testified in support of lowering the speed limit. “It’s a really important symbolic thing that can be done to tell residents and visitors the kind of community we’re trying to create here” said DeWolfe told Streetsblog. State Representative Denise Provost, of Somerville, says winning statewide approval for such a change is a difficult political task. She’s tried unsuccessfully in previous sessions to pass legislation enabling cities to lower speed limits. Provost said it’s probably too late for a bill authorizing Boston to lower its speed limit to pass before the legislative session ends in July. Perhaps a revised approach may help, she says. Provost was inspired by New York City’s successful bid to lower its default speed limit to 25 miles per hour, which also required state approval. She said perhaps if a handful of Boston-area cities, like Boston, Somerville and Cambridge, sought a combined regional speed limit, they might prevail. Is this really so hard? Don’t lower the statewide guidance, just allow cities and towns to go lower if they so choose. Alternativley, do what is frequently done in IL, allow it in cities with a population over X. There are plenty of laws in IL that only apply to municipalities with a population over 1 million. Guess where those apply? Who cares of every town has different speed limits? Who cares. People will speed anyway. Vision 0 is absolute stupidity. And anyone who thinks its with time and energy needs to get a real job, and not telling people what’s good for them. Angie you need to be hit by a speeding car you nitwit. Is this sarcasm? If not, maybe you’d like to volunteer your children to be killed by car crashes. Are 20mph speed zones not a thing? Just put up a sign every direction coming into the city. Better yet would be to reconstruct the streets so that even 20mph would feel uncomfortable when driving. well, in California for instance, speed limits are set to the 85th percentile of observed traffic. Generally the reasoning is that it does little good and possible harm to set the limit lower than what people actually drive. As a pedestrian I question that reasoning, but right now this is what the law says. The complaint then is that if some little town gets to set its own speed limits without state regulation, then some little towns will set the speed limit drastically lower in order to extract speeding fines from a large number of drivers going through. Of course, a major city can’t function as a speed trap – it *is* the destination rather than an obstacle on the way. So the logic doesn’t really apply. But it’s what the law is meant to deal with. And hence the reason to design streets for the speeds you want people to drive. If you want them to drive 20 mph, they shouldn’t be designed for 40 mph, e.g. Presumably if a city is not allowed to set, say, a 20 mph speed limit because of state law, then it also isn’t allowed to do an end-run around that state law by simply sticking speed bumps everywhere to achieve the same effect. This is a feature not a bug. If people were unsure what the local speed limit was, perhaps they would be more cautious and conservative until they verified what the actual limit was.